Buenos Aires : China's President Xi Jinping attends the G20 summit in Buenos Aires, Argentina, Friday, Nov. 30, 2018. 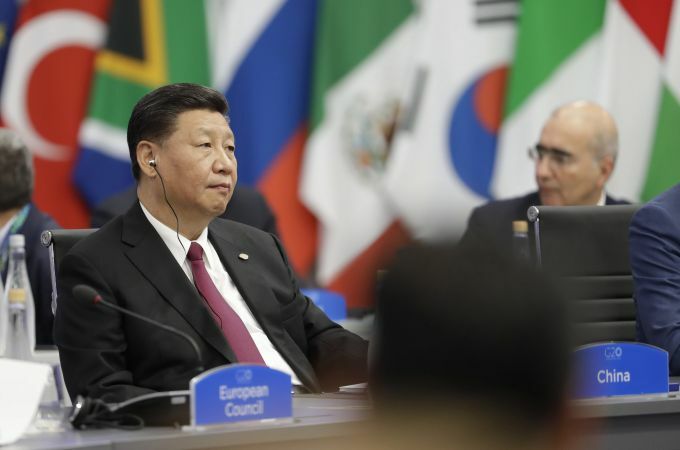 Heads of state from the world's leading economies were invited to the Group of 20 summit to discuss issues like development, infrastructure and investment, but those themes seem like afterthoughts, overshadowed by contentious matters from the U.S.-China trade dispute to the conflict over Ukraine. Buenos Aires : First lady Melania Trump, left, and Argentina's first lady Juliana Awada, pose for a photo during a visit of partners of the Group of 20 leaders, at the Villa Ocampo cultural center in Buenos Aires, Argentina, Friday, Nov. 30, 2018. 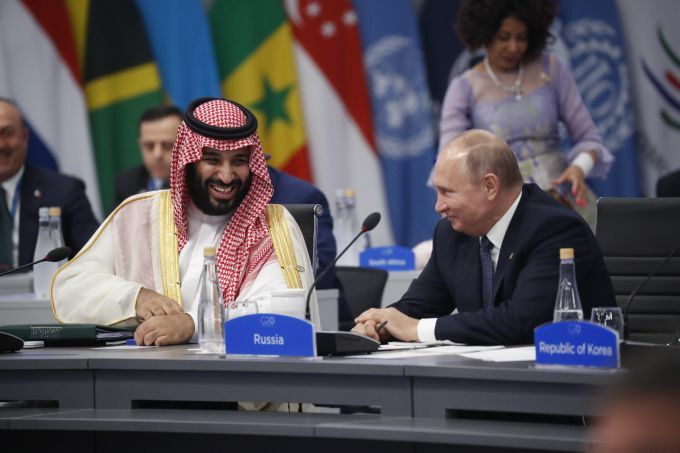 Buenos Aires : Saudi Arabia Crown Prince Mohammed bin Salman talks with Russia President Vladimir Putin during a G20 session with other heads of state, Friday, Nov. 30, 2018 in Buenos Aires, Argentina. 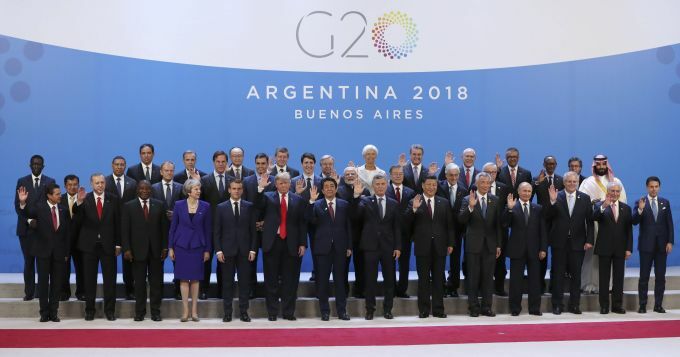 Buenos Aires : Leaders attending the G20 Summit pose for the family photo at the Costa Salguero Center in Buenos Aires, Argentina, Friday, Nov. 30, 2018. Buenos Aires : Argentina's President Mauricio Macri, front right, points as he and other world leaders gather for the group photo at the start of the G20 Leader's Summit at the Costa Salguero Center in Buenos Aires, Argentina, Friday, Nov. 30, 2018. 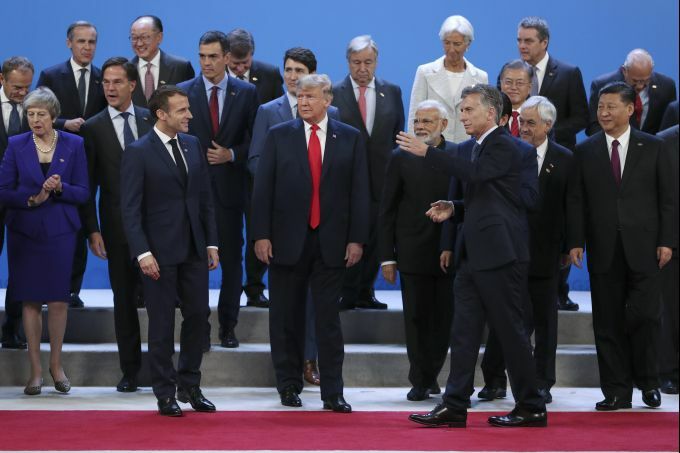 Bottom, from left, stand Britain's Prime Minister Theresa May, the Netherlands' Prime Minister Mark Rutte, France's President Emmanuel Macron, President Donald Trump, India's Prime Minister Narendra Modi, Chile's President Sebastian Pinera and China's President Xi Jinping. European Council's President Donald Tusk stands far left. Spain's Prime Minister Pedro Sanchez stands fourth from top left. Canada's Prime Minister Justin Trudeau stands behind Trump. European Commission's President Jean-Claude Juncker stands fifth from top right. International Monetary Fund Managing Director Christine Lagarde stands top, fourth from right. South Korea's President Moon Jae-in stands top, third from right. 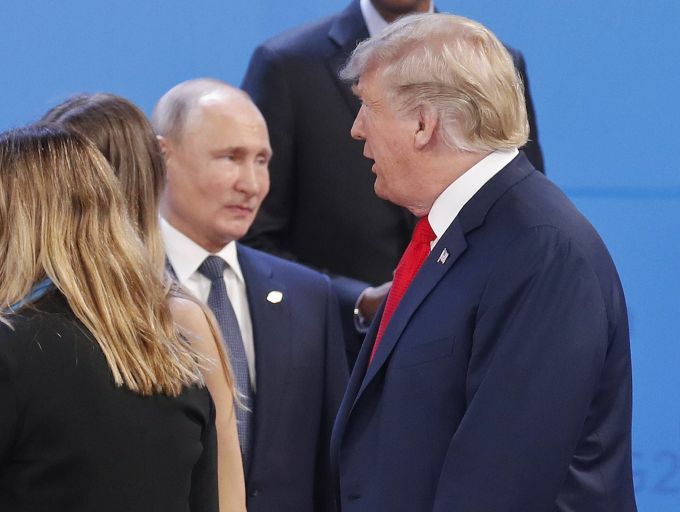 Buenos Aires : Russia's President Vladimir Putin, left, watches President Donald Trump, right, walk past him as they gather for the group photo at the start of the G20 summit in Buenos Aires, Argentina, Friday, Nov. 30, 2018. Leaders from the Group of 20 industrialized nations are meeting in Buenos Aires for two days starting today.